Those of you who have just purchased a new Windows Phone 8 device might have noted that there are some gaps with regards to apps. Previously available apps are not showing in the marketplace and are in need of an update. One such app is the high profile Spotify offering. The app was a long time coming on Windows Phone 7 and many subscribers rely on it greatly to get their mobile music fix. Even with the advent of Xbox Music and competing services like Rdio, Spotify still offers up a compelling selection, especially for those with specialist music tastes. We approached Spotify to seek clarification on the future of the Windows Phone app and were pleased to get a response within almost minutes of launching the request. 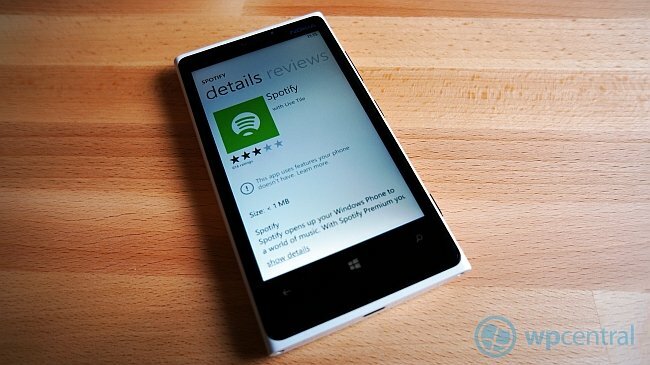 The good news is that they are “working on a Windows Phone 8 Spotify app and to watch this space”. We’re obviously really pleased they are continuing to develop for Windows Phone and hope that the new app makes use of the new features of the platform. We hope that there isn’t too much of a wait. If you have moved over to Windows Phone 8 recently then we’d suggest checking out Xbox Music or Rdio in the meantime to see if that will fill your needs. The question does remain as to why such a high profile app on the platform is missing in action at the very launch. As soon as we get any more information from Spotify we’ll pass it on. We have also noticed that the web app store is not showing Spotify at the moment but it is still possible to search from a WP7 device and grab the app from there. We're unsure if this is a sign of the app being hidden in lieu of an update or just web store oddities.